This fourth in a series of posts about great hikes with children around the Northeast explores the landscape of the Hudson River Valley, where so much of the hiking is colored by the region’s especially vivid history. We start in the Hudson Highlands, about 60 miles north of New York City, and follow the river north to the Shawangunks and the Catskills, touching on some of the region’s important roles along the way. Storm King, Storm King State Park, West Point. The signature hike of the Hudson Highlands overlooks the Hudson River at the head of the Highland Gap. A few miles south along this deep and narrow section of the river, at West Point, American forces in 1778 forged the Great Hudson River Chain to keep British ships from advancing northward, changing the course of the Revolutionary War. A successful legal battle in the mid-1960s to keep a power-generating plant from being built on Storm King helped create the field of environmental law and set the groundwork for such national legislation as the Clear Air Act and the Clean Water Act. The 6.0-mile roundtrip hike to Storm King on the Stillman Trail gets nearly all its 400 feet of elevation gain out of the way in the first mile, as it reaches the grassy summit of Butter Hill. At 1,380 feet, Butter Hill is 40 feet higher than the dramatic escarpment of Storm King. Butter Hill can be a good destination, but continuing the hike brings stunning views of the river and the Highlands — colorful at any time of year but especially in the fall. The hike’s excellent effort-to-reward ratio makes it a good choice for young hikers ready for a challenge. Anthony’s Nose, Bear Mountain State Park. About 10 miles downriver from West Point, across the river from Peekskill, New York, an unusual child-friendly 4.0-mile roundtrip hike goes through a zoo, past a Trailside Museum, onto the earliest section of the Appalachian Trail (AT), built in the early 1920s, and up to ledges with spectacular views of the Hudson River. In the fall, the AT carries few, if any, north-bound through-hikers. It’s a 1,360-mile walk from the trail’s beginning in Georgia to this historic section of the trail at Bear Mountain. At 124 feet above sea level, this trail also contains the lowest section of the Appalachian Trail. The hardest part of the hike is the short AT section, which starts in that low point and rises 700 feet in 0.6 mile. Leave the AT to follow the blue blazes of the Hudson River Trail along an old woods road to the open ledges of Anthony’s Nose. From here, you can look down on the exact site of the great chain mentioned in the Storm King hike. Roosevelt Woods, Franklin Delano Roosevelt National Historic Site, Hyde Park. The home of the 32nd president of the United States and home of the first presidential library also offers “wide, well-marked, and immaculately maintained ‘carriageways,’” which Kick says make perfect walking trails for children. Follow one of three trails (Meadow, Cove, or Forest), none more than 1.0 mile in length, or create longer loops through mature oak and hickory forests. Many of the trees were planted by Roosevelt and his father. These trails and others in the Hyde Park Trail network were originally built by members of the Civilian Conservation Corps (CCC), which was started by Roosevelt shortly after he took office. Walking to the edge of the Hudson River may reward you with views of tankers and tug barges. The Trapps, Shawangunks, New Paltz. This easy trail along carriage roads provides an excellent introduction to what Kick calls “the scenic and recreational mecca of the mid-Hudson Valley.” The 5.0-mile roundtrip hike wanders beneath and above steep cliffs that are renowned among climbers for world-class rock-climbing routes. (Shorter hikes are also possible.) Especially on weekends, part of the fun of this hike comes from watching climbers work their way up the rock. The hike lies within the Mohonk Preserve, a 10,000-member nature preserve. You don’t need to be a member to hike the trails, but there are fees for parking and use of the shuttle bus between parking lots and the trailhead. Kaaterskill Falls, Palenville. This hike is considered the most popular short hike in the Catskills. The two-tiered falls are the highest in the state, falling a total of 260 feet. Though the water coming over the falls may not be as spectacular in the fall as in spring or summer, the 0.4-mile trail into the falls will be much less crowded, making it more possible to see the falls as early Hudson River painter Thomas Cole saw them in the early 1800s. Now that the trail has been relocated farther from the base of the falls, the most dangerous part of this outing is the 0.2-mile walk along NY 23A to the trailhead. My final post in this series will take us to urban walks and country rambles around Boston. You can find detailed descriptions of these hikes in AMC’s Best Day Hikes in the Catskills and Hudson Valley by Peter W. Kick. Many of these trails are maintained by the New York–New Jersey Trail Conference. Images: Morning, Looking East Over the Hudson Valley from the Catskill Mountains, Frederic Edwin Church, 1848. 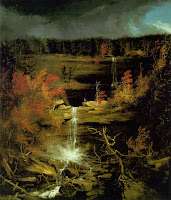 Falls of Kaaterskill, Thomas Cole, 1826.